We here at the ATT blog struggle, just a little bit, when we write about the performers who are honored throughout the tour. We want to do them justice, but it's impossible. We're going to call out the Everly Brothers today, but how do you do justice to them when they recorded about seventeen kazillion songs in a career that lasted forty-two blavillion years? We could talk about the members of their bands, the popularity and significance of each song, stories about the recording of each album, but there's just no time. So today, we will concentrate on the second studio album they created, lovingly entitled Songs Our Daddy Taught Us. 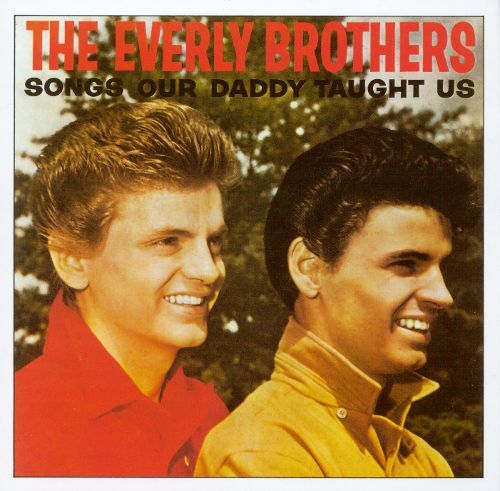 The Everly Brothers has been described as a "close harmony/country/rock 'n' roll" duo. Isaac Donald "Don" Everly and younger brother Philip "Phil" Everly were born into music, touring with their dad when they were still known as Little Donnie and Baby Boy Phil. They recorded their first song, "Keep A-Lovin' Me," when Don was only 19. It flopped, but they persisted and made their first top-ten hit in 1957 with "Bye Bye Love." This started a decades-long career, with their first two albums released in 1958, including Songs Our Daddy Taught Us. The album was critically praised, if not as popular as their eponymous first record. It includes traditional songs by Charles Monroe, "Down in the Willow Grove," and Gene Autry, "That Silver Haired Daddy of Mine," and the 17th-century ballad, "Barbara Allen." If you need a refresher, it's not hard to find! Of course, if you just want to look at the cover art, you can do that any time here at the American Treasure Tour!